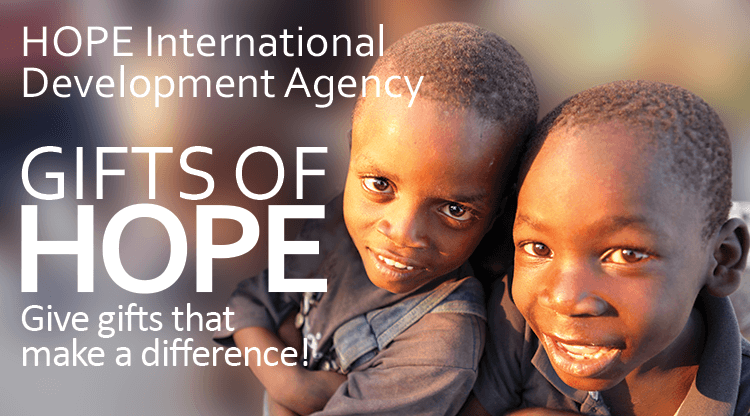 HOPE International Development Agency is a non-profit organization headquartered in the Vancouver region of British Columbia, Canada. We are a registered charity in Canada, the United States, Japan, Hong Kong, Singapore, New Zealand, and the United Kingdom. We use the latest security technology, including Norton Secured, Powered by Verisign to protect your personal information. Each gift has the power to change lives, including your own. You can also give your gifts in recognition of family, friends, and colleagues. After selecting and confirming your gifts, you can add information about the individuals when you enter your personal and payment information. We'll send them a special note, telling them about the gift and the giver. Enter the quantity and then press "Add" to add your gift(s) to your gift shopping cart. When you've finished selecting your gifts and quantities, press "continue" at the bottom of the page. Help children overcome the poverty and prejudice they and their families face. Give a safe place to learn, schoolbooks, supplies, nutrition training, and vegetable gardens that will transform the lives of indigenous people living on the Philippine island of Mindanao. You have given an orphaned child in Ethiopia a brand new start with an education, nutritious food, a place to live, and much more! Ethiopia - Help orphaned children in Addis Ababa, Ethiopia regain their health, well-being, and bright future. Give safe shelter, nutritious food, medical care, counselling, and education, including school supplies and books. Ethiopia - Helping disadvantaged children complete their education and development ensures they will have a better life now and as adults. Give schooling and supplies, along with necessities that make life better for children. South Sudan - Make it possible for children in South Sudan to become tomorrow’s community leaders. Give desks, latrines, and access to teachers. This practical support will nurture children in a healthy learning environment and ensure that they reach their full potential. Bangladesh - Help a family create a sustainable way to earn a reliable income and gain a good source of healthy protein by giving chickens. Vaccinations and animal husbandry training are included. Bangladesh - Help a family create a sustainable way to earn a reliable income and gain a good source of healthy protein by giving a goat. Vaccinations and animal husbandry training are included. Bangladesh - Help a family create a sustainable way to earn a reliable income and gain a good source of healthy protein by giving a cow. Vaccinations and animal husbandry training are included. India - Help a family create a sustainable income and a reliable source of nutritious food. Give a herd of goats to a mother. Cambodia - Help a family create a sustainable income and a reliable source of nutritious food. Give a pair of pigs to a mother. Myanmar, South Sudan, Dominican Republic, Bangladesh, Nepal, and other countries - Help families who are fleeing conflict or affected by disasters. Give locally-sourced recovery resources such as seeds, tools, shelter, drinking water, cooking pots, utensils, and medical support that will help families recover as quickly as possible. Haiti - Ensure a family has the ability to feed and sustain themselves, even in adverse conditions. Give a generous portion of carefully selected seeds along with training in ecological farming and agro-forestry methods. Any food not consumed by the family will be sold at the local cooperative, generating a reliable source of income. Haiti, Honduras, Dominican Republic - Help rural doctors and nurses save lives that would otherwise be lost to treatable illnesses. Give medicines, medical supplies and equipment needed to treat injuries and save lives in rural communities. India - Give families access to clean water right in their homes. This is an especially important aspect of life in communities where drinking water is often contaminated and makes families sick. Give easy-to-make, cost-effective biosand water filters that purify local water. Ethiopia - Gravity-fed water systems are a cost-effective and long-lasting way to collect clean water from underground springs and then distribute it over great distances via pipes to water taps in the community. Give clean water. Ethiopia - Gravity-fed water systems are a cost-effective and long-lasting way to collect clean water from underground springs and then distribute it over great distances via pipes to water taps in the community. Give clean water. Add $200 to your gift and a mother can join a self-help group that will provide training and a loan to start a small family business to earn a sustainable income. Philippines & Cambodia - Clean water, supplied by gravity-fed systems that store and distribute clean water from mountain springs, or hand-dug wells, will make it possible for families to have safe drinking water near their homes rather than using unsafe water found in muddy streams or ponds outside their community.